Old Hickory is Made in the USA! 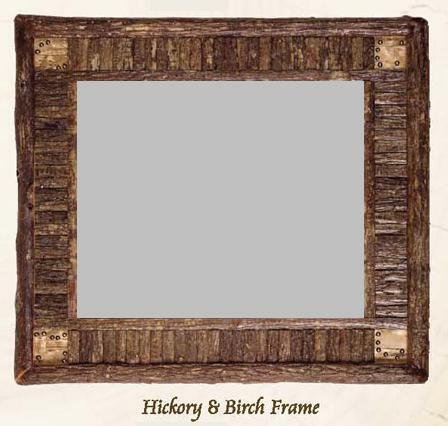 Pieces of hickory sapling are featured in this frame, which is cornered with pieces of birch bark. Price shown is for 24x28 mirror. See drop down window for other sizes and prices. Please call for pricing on frame only. Made in the USA! The hickory wood with which Old Hickory constructs their furniture is from the Tennessee Valley, and has been for over 100 years. Like handmade furniture from over 100 years ago, this lovely furniture is produced in the USA with the woods, barks, and superior craftsmanship necessary to turn out durable, comfortable, practical furniture. 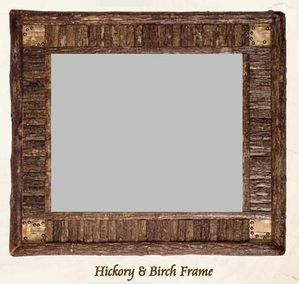 Learn more about Old Hickory Furniture. Size options only on this item.